Another Stan Lee, Jack Kirby creation. Thor first appeared in Journey into Mystery (1952 series) and starting with issue #126 the titled was re-titled Thor (1966 series). The title is also known as the Mighty Thor. We have 271 of the 377 issues. This is the first series of Thor comics. But earlier, shorter stories appeared in Journey into Mystery. 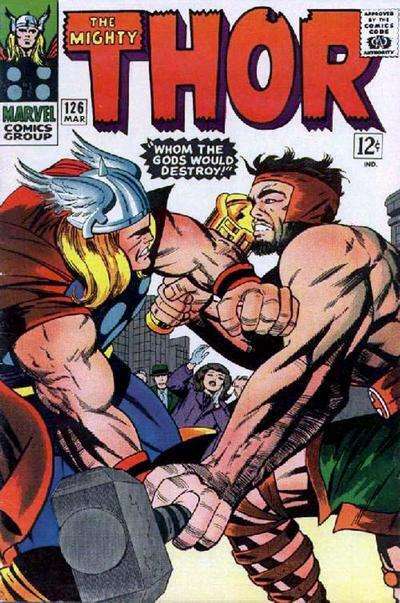 Click, for a full list of all Thor comic books for sale. Some Thor comic book series contain only a couple of issues and others are longer, such as Thor (1988 series). Any Thor comics for sale that you buy comes with a total money-back guarantee. As a result, if you're a Thor fan, looking for Thor comics for sale, look no further! Do your ever wonder what it would have been like to have see Babe Ruth play in his prime? Well, guess what, it doesn't make a difference, because you can't. But, 50 years later, you can still see what it was like to experience comic books' greatest writer/artist team of Stan Lee and Jack Kirby at their peak. And the early issues of Thor (1966 series) have some of their best work. After creating a team of super-heroes bombarded with gamma rays (Fantastic Four) and a teenager bitten by a radioactive spider (Spider-Man), the Lee/Kirby team set their sights on Norse mythology to create the Mighty Thor. On a mission from his father, Odin, Thor acted as a superhero while maintaining the secret identify of Dr. Donald Blake, a physician with a partially disabling leg injury. When he tapped his cane on the floor, it became the magical hammer Mjolnir and Black transformed into Thor. So, you can either read the 1,600 page book, "The Complete History of Norse Mythology" or, pick up some issues of Thor (1966 series).